Shirts and ties business is one of the world’s most saturated businesses. Any person, who thinks of investing and starting a business, is highly likely to consider the business of men garments and accessories. In such a tough and unnerving business, it is hard to make an impact, unless you try custom tie boxes for your neckties. Custom made tie boxes are not only made with a view to preserving the sensitive fibers of a silk-made necktie but also to attract the target customers and lure them into buying the neckties made by your brand. Unless you do not ponder much, it is the packaging of a product that makes a person have a look at the product. 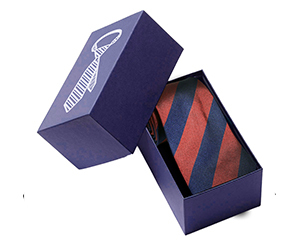 What is in a Personalized Tie Box? Material – Custom made tie boxes are made of many different materials such as Kraft, plain cardboard, corrugated fiber and other mixes materials. Colors – If you buy custom made tie boxes, the packaging companies will ask you about the choice of color; you may choose from CMYK and Pantone models, which is not the case in premade boxes. Shape & Structure – Customized tie boxes may come in many different variations pertaining to shape and structure. These may be open end boxes or close end boxes. The pillow boxes can also be used for packaging of neckties. Design & Finish – After all important choices are made, it goes down to design and finish. 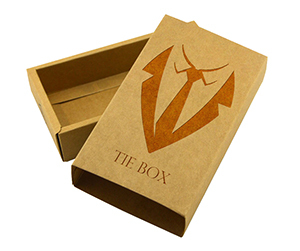 A necktie box encases a fancy product of professional use. The packaging of such a product should be equally professional. You can choose the matte or glossy finish for your custom made necktie box, and to improve its looks, you can opt either gold or silver foiling. Die cut window pane is also a good idea. Last, but not the least, you may choose embossed wording, debossed logo or raised ink for both to improve the branding of your product. Why Get Customized Tie Boxes from PackagingBlue.Com? Affordable Pricing – We offer our packaging services at very affordable rates. Free Shipping – We charge zero for shipping charges. You do not pay a cent but only for the packaging that you get. Professional Offset Printing – We provide highly professional offset printing and packaging services. Fast Turnaround Time – It takes only 3 to 4 days and you get your custom boxes delivered on your doorstep. Customer & Sales Support – We have two teams: a customer support team and a sales support team, to ensure a fast, smooth and satisfying delivery of your custom tie boxes. Ecofriendly Packaging – At PackagingBlue.Com we nurture positive values such as our go green initiative. We are aware of the environmental challenges, and we strongly condemn the use of plastic in packaging. This is why we use 100% biodegradable materials which bear no harm to animals or kids. Still got some questions in mind? No problem, if you want to learn more about our custom tie packaging, please contact our 24/7 customer support team right now.